In this tutorial, you will learn how to use an Infrared remote with a Raspberry Pi configured as a media center. The IR receiver is attached to the GPIO connector on the Raspberry Pi. Before tackling this project, you need to follow this tutorial to set up your Raspberry Pi as a media center. To build this project, you will need everything from the Media Center setup tutorial and the following items. 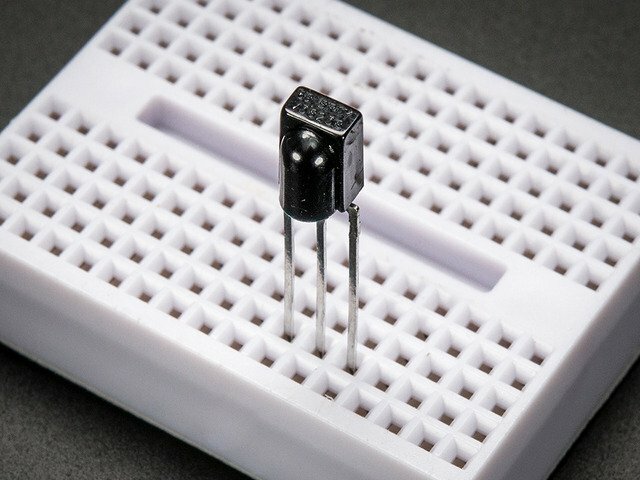 The IR sensor has just three pins, that will connect with three pins on the GPIO connector. To do the connecting, we can use female to female jumper leads. These make a good reliable connection as the IR sensor has unusually thick leads for an IC. Make the connections as shown below. 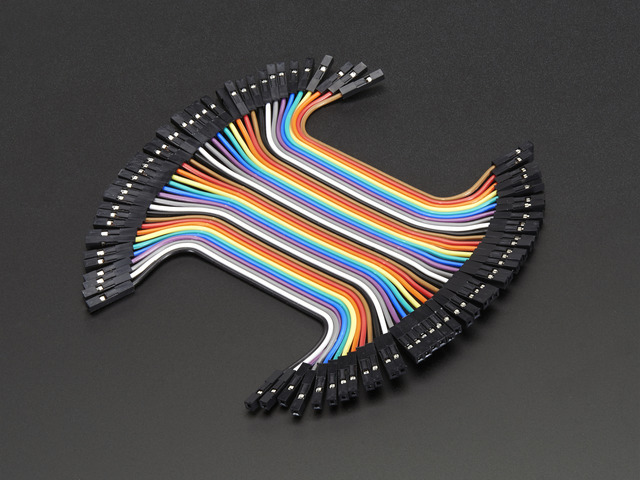 Note that you do not have to use the same colored jumper wires. But selecting adjacent wires that are still in a 'ribbon' will help keep things neat. Note that the IR sensor chip needs to be operated at 3.3V not 5V when used with the Raspberry Pi. The interface between the hardware and the Raspberry Pi media centre is managed by a piece of software called LIRC (Linux Infrared Remote Control). This is pre-installed on most recent Raspberry Pi distributions and is included in the Rasbmc distribution, so there is nothing to install, however, there is some setting up to do. To make sure that the IR hardware is correct, we can connect to the Raspberry Pi running Rasbmc using SSH, which is automatically enabled on this distribution. If you have not connected to a Raspberry Pi using SSH before, please see this tutorial. You can find the IP address of the Raspberry Pi using the XBMC System Info page. To be able to test the IR receiver without XBMC, you need to make sure that the IR remote feature is turned off, or you will not be able to use LIRC from the SSH. So run the Rasbmc Settings program and make sure that the option Enable GPIO TSOP IR Receiver is disabled. If you needed to change this you will need to reboot. Now hold the remote in front of the receiver and you should see a series of 'pulse' / 'space' messages appear each time you press a button. Congratualtions! The IR receiver is working. Now that we know that the hardware is okay, we need to give LIRC a config file to tell it about the keys on the remote that we are using. ... and then paste the following text into it, before saving the file by clicking CTRL-x then Y. This file should be saved in the home directory for the user pi. Restart XBMC and when it has rebooted, you should see a small popup message in the bottom right corner like the one below. 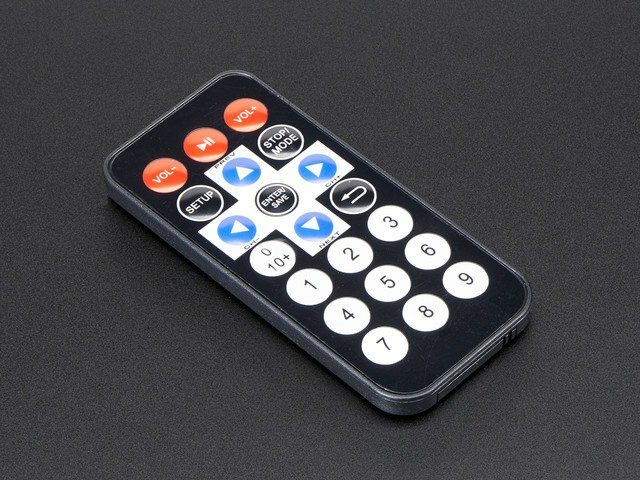 You should now find that your IR remote control will work and that you no longer need the keyboard and mouse to control XBMC. I generated the config file for this remote using a utility that is part of LIRC called 'irrecord'. If you have a different remote, then you can generate a config file for it using this tool. Turn the remote off on XBMC using Rasbmc as we did before using 'mode2'. Type the command 'irrecord --list-namespace'. This will tell you the allowed key names that you can use when prompted. Follow the instructions to the letter. It all seems a bit odd, but the program has to work out the timings and encodings used by the remote. This guide was first published on Mar 15, 2013. It was last updated on Mar 15, 2013.